A dear friend of mine is moving to New York City. She’ll be living in Manhattan, starting a new job, and be experiencing many new adventures for sure….she is a very lucky girl. I’m also a very lucky girl to call her my friend! She has been there for me through the thick and thin the past few years. We’ve shared an office, a neighborhood, our addiction to coffee, carpooled for a bit of time, and many nights over a glass (or 2) of wine. She is one of those friends that just gets me, even when I don’t get me. I’m going to miss having her so nearby but can’t wait to see how our friendship changes. I’ll likely be enjoying more weekends in NYC once I’m back on my feet again, which I can’t wait for! When she moved into my neighborhood I painted her a watercolor of a street in Philadelphia…Pine Street to be specific…as a housewarming gift. This was one of the original watercolors I did before starting Hand-Painted Weddings. 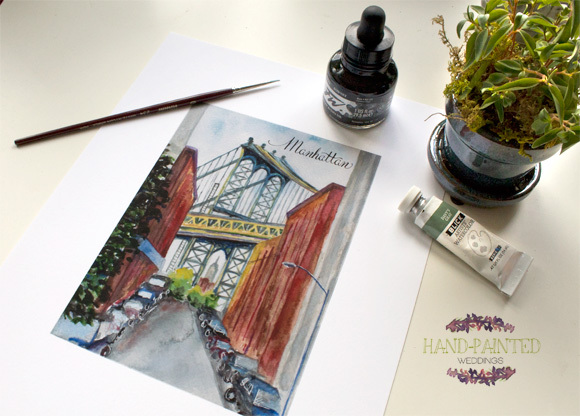 It only seemed appropriate to paint her a watercolor of NYC to add to her budding collection. The view in this painting is from a street in Brooklyn looking towards the Manhattan Bridge with the Empire State building peeping through the archway. Very nice, Allison. Love it!